Work even more effectively by filtering all 360° images of your project according to individually set categories. Add categories to your 360° scenes to filter and only show specific images according to the set categories or the selected time frame. Set up any individual tags and labels as categories for a project in the Project Properties. Click on the project’s name at the top of the editor to open the Project Properties. In the right-hand side panel, switch to the tab ‘Categories’. Here you can add and manage the labels and tags for this project. Once you have finished setting up the categories, click SAVE CHANGES to save your project. Please note that in the JobWalk app it is currently only possible to categorize your scenes but not to create new categories. You can only categorize scenes in projects that have already categories created with the web editor. Write a category name in the text field below ‘Add new category’ and click on ADD to create this new category. Repeat this process until you have created all necessary labels. All created labels will appear in the category list above. In the list, you will see the name of the category as well as the total number of matched 360° images (‘Total Photos’) in this category. Any category can be deleted directly in the list overview. In the ‘Actions’ column, click the little recycling bin to remove the corresponding category. Confirm in the popup to remove the category completely from the project. Please note that all 360° images assigned to this category will simply be removed of this category and must be relabeled manually if desired. To edit your category name, click the little pen icon in the ‘Actions’ column to rename the corresponding category. Double click with your cursor on the current category name to select the name and start typing. The label will be overwritten. Confirm the changes with the checkmark or decline by clicking the in the ‘Actions’ column. The name of the category will be changed for all scenes that are already tagged with this label. Each scene’s 360° image must be categorized individually. First, select the scene you want to tag (1). The categories can be applied to the scene in its individual ‘Scene Properties’. Click on the scene’s name above the preview thumbnail or on the little pen next to it to open its ‘Scene Properties’ (2). In the scene properties, switch to the ‘Categories’ tab in the panel on the right (1). You will see the complete list of created categories for this project. Scroll the list to look for the categories you want to apply to this scene. Click the corresponding checkbox for a label to add this category to the scene (2). It is possible to add multiple categories to a single 360° scene. Combine any labels to your liking. Save the selection of categories with SAVE CHANGES (3). Please note that you need to categorize each TimeTravel scene individually. The categories applied to a preceding scene will not be automatically applied to the connected TimeTravel scenes. Please note that it is only possible to tag projects in the JobWalk app if the project has already categories applied through the web editor. It is not possible to create (new) categories within the JobWalk app. 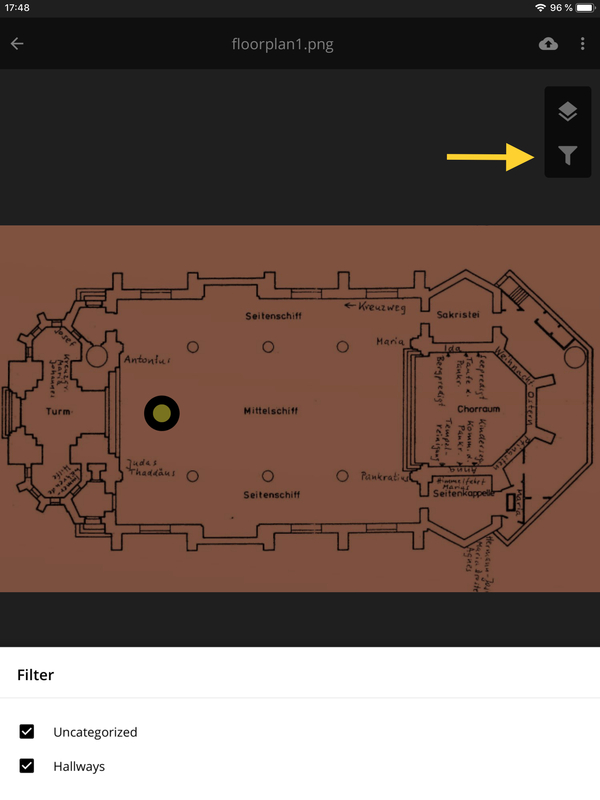 In the sheet view, tap on the waypoint of an existing scene you want to categorize. Then open the 360° image. Tap on the categories icon on the right side of the screen to open the list of categories (image 2 below). Scroll down the list to look for the right categories. Tap the checkbox to apply a category to this image. 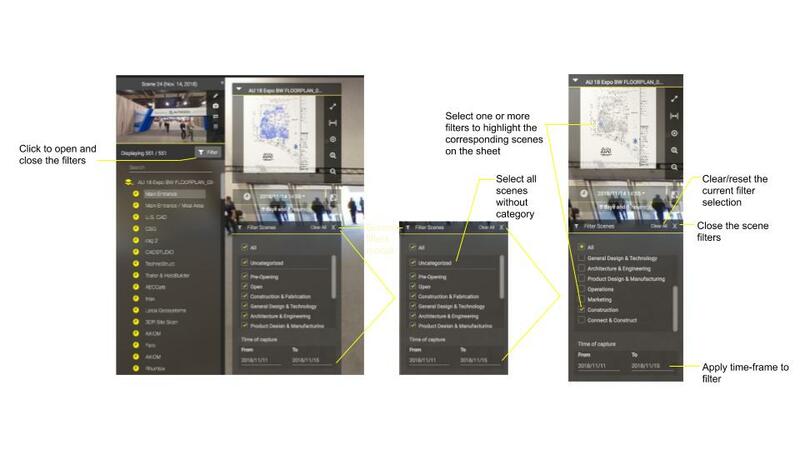 Tap again on the categories icon to close the category list and apply your selection of categories to this 360° image. Return to the sheet view and select another waypoint to categorize the corresponding 360° image. Repeat these steps to categorize more scenes. Once all or even only a part of the scenes is categorized, it is possible to filter the scenes accordingly. 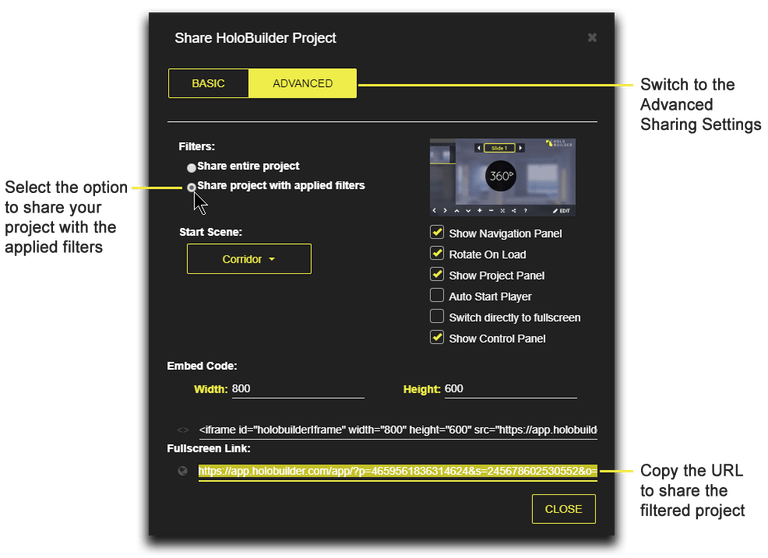 Scenes can be filtered in the web editor and player as well as the JobWalk app to get a better overview of large projects when working on the project or reviewing it. Applying the filters in the web editor and player works alike. Click the ‘Filter’ button in the Project Panel on the left to open the scene filters modal (1st image below). In the modal, check or uncheck any filter name to show or hide only scenes tagged with this category. Uncheck CATEGORY to remove the check in all listed categories. No scenes will be shown in the panel on the left and all waypoints on the sheet will be greyed out. Check CATEGORY to add a check in all listed categories below. All scenes will be shown in the panel on the left and all waypoints on the sheet will be displayed in blue. Check/uncheck ‘Uncategorized’ to show or hide all scenes that are not yet assigned to at least one category of the ones listed below. Check or uncheck specific categories from the list below to only show scenes tagged with that/these categories. When checking multiple categories all scenes included in those categories will be shown in the panel on the left. Please note that the selected categories will not be accumulated to only show the scenes with both categories. Restrict the time range of the displayed 360° images with a set date for the time of capture. Apply a start and end date for the time frame. Only images with time stamps within this time period will be shown and filtered according to the selected categories. Note that you can use the time filter also for all scenes without selecting only specific categories to be filtered. All scenes contained in the currently applied category selection are highlighted in blue (see image 3 below). Select ‘Clear All’ to undo your current category and date selection. Select the "X" button to close the filters modal again. In order to be able to use Categories in the JobWalk app, you first need to set up the categories in the web editor. Make sure to have categorized your scenes in the web editor or JobWalk app prior to applying the filters in the app (see above). Applying filters while editing a project will help you identify special scenes according to your individual criteria. In order to use the category filter while editing your project in the JobWalk app, open the project in the app in the editing mode. Click on the FILTER button to open the category list. Click the filter icon at the right hand side of the screen. Check or uncheck specific categories from the list below to only show scenes tagged with that/these categorie/-s. 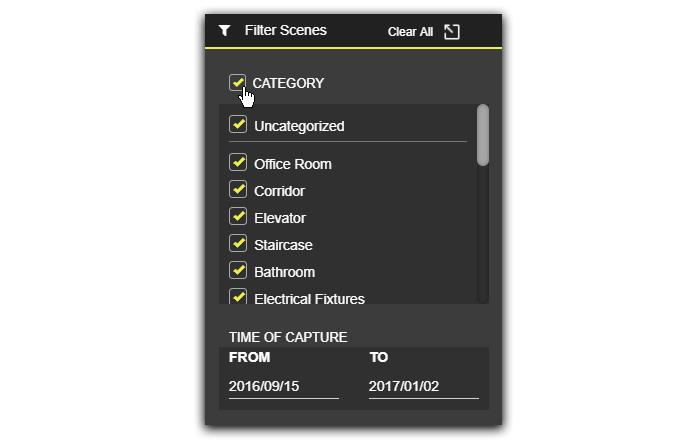 When checking multiple categories only scenes included in those categories will be highlighted with a yellow center on the floor plan. All scenes not within the categories selected will appear greyed-out. Please note that there is no TIME OF CAPTURE filter in the JobWalk app. Share filtered projects to provide viewers access only to selected scenes. The viewer will only be able to see the scenes which are related to the selected categories or timeframe. All other 360° images will be greyed out. In the editor, select the filters you want to apply to your project for sharing as described above in Section 4.1. Once selected, click on the sharing symbol next to the project name. In the share settings, switch to Advanced. Under ‘Filters’, choose ‘Share project with applied filters’. This option will apply the selected filters to your project and when sharing the URL below, only the scene contained in the selected categories will be highlighted.